After several weeks away from the boat (hiding from Christmas) I am now back. Isabelle Amy was born by CS on December 31st at 1005 and weighed in at 8lb 1/2oz. She looked and still does look gorgeous. She had slight jaundice but not enough to be kept in so they were both back home on Saturday when I returned to the boat and the snow. Abigail Jenna is in the middle of these. Nice looking (must be getting on for vintage) wagon was delivering log this morning. Happily I have coal on board. 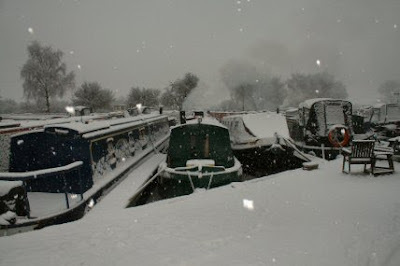 In the next few weeks when the ice is thawing I will be off to Ferrybridge to pick up some more and then possibly try for Wigan via Bingley. There might be a stop in Leeds for a few days. The snow is lying on top of the ice. You can just see the solar panel on the boat. I went down and cleared the snow off it. Not a job taken lightly with the snow on the gunnels :-) I am not linked to the power supply at the moment so need to run the engine occasionally. 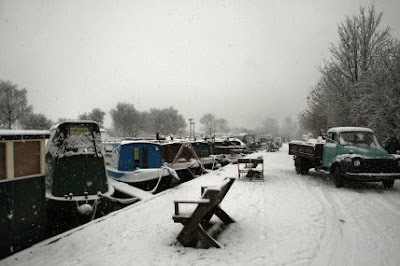 The snow is still falling but inboard with the fire well and truly lit I am in shirt sleeves it gets so warm. 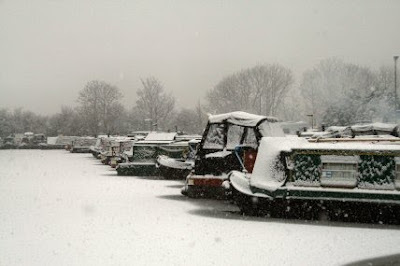 Mind you first thing in the morning would be enough to put people off boating in winter with ice on the inside of the windows. I did mention that there was not much room for error mooring up. I only have one fender down and that had to be kicked into place. At least the boat doesnt move a lot even if the ice wasnt there.